Alison Langley has earned national recognition for her exquisite nautical photography, capturing the light, beauty and motion of classic yachts around the world. She studied film at New York University, and photography at the Rhode Island School of Design. In the six years following she sailed around the world, publishing her images and stories in magazines such as Cruising World, Yachting, Sail, Marie Claire, Travel & Leisure and Islands. Alison now lives in Camden, Maine with her husband and children, frequently cruising aboard their 1928 restored classic Italian yacht, “Sincerity”. 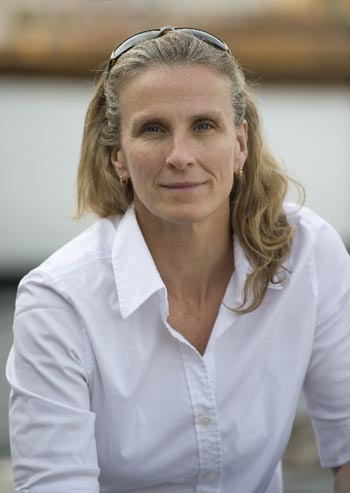 Alison continues to photograph yachting events worldwide, and shoots on assignment regularly for both the editorial and commercial boating industry. Alison’s personal work of black-and-white limited edition prints, calendars, note cards and posters are sold in gift shops throughout New England, and at her gallery, Nautical Images, located in the historic Knox Mill Building in Camden, Maine. Visit her website at www.langleyphoto.com, email her or call her at 207-236-7900.